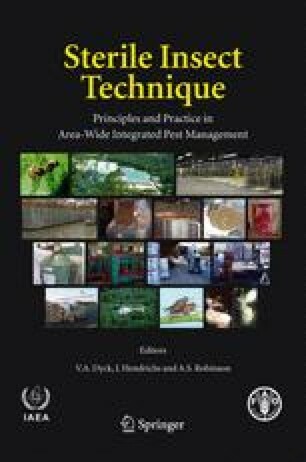 During the 1930s and 1940s the idea of releasing insects of pest species to introduce sterility (sterile insect technique or SIT) into wild populations, and thus control them, was independently conceived in three extremely diverse intellectual environments. The key researchers were A. S. Serebrovskii at Moscow State University, F. L. Vanderplank at a tsetse field research station in rural Tanganyika (now Tanzania), and E. F. Knipling of the United States Department of Agriculture. Serebrovskii’s work on chromosomal translocations for pest population suppression could not succeed in the catastrophic conditions in the USSR during World War II, after which he died. Vanderplank used hybrid sterility to suppress a tsetse population in a large field experiment, but lacked the resources to develop this method further. Knipling and his team exploited H. J. Muller’s discovery that ionizing radiation can induce dominant lethal mutations, and after World War II this approach was applied on an area-wide basis to eradicate the New World screwworm Cochliomyia hominivorax (Coquerel) in the USA, Mexico, and Central America. Since then very effective programmes integrating the SIT have been mounted against tropical fruit flies, some species of tsetse flies Glossina spp., the pink bollworm Pectinophora gossypiella (Saunders), and the codling moth Cydia pomonella (L.). In non-isolated onion fields in the Netherlands, the onion maggot Delia antiqua (Meigen) has since 1981 been suppressed by the SIT. In the 1970s there was much research conducted on mosquito SIT, which then went into “eclipse”, but now appears to be reviving. Development of the SIT for use against the boll weevil Anthonomus grandis grandis Boheman and the gypsy moth Lymantria dispar (L.) has ended, but it is in progress for two sweetpotato weevil species, Cylas formicarius (F.) and Euscepes postfasciatus (Fairmaire), the false codling moth Cryptophlebia leucotreta (Meyrick), the carob moth Ectomyelois ceratoniae (Zeller), the cactus moth Cactoblastis cactorum (Berg), the Old World screwworm Chrysomya bezziana (Villeneuve), additional Glossina spp., other Anastrepha spp. and Bactrocera spp. fruit flies, and other pest insects.